Corporate whore no more! : Vivaaaa Macau! Just a quickie to fill you in on Macau. As I said in the last post, it's gambling central. This special administrative region of China pulls in more gaming money than Vegas. Apparently, on average, its tables are immensely more profitable than Sin City's. I was stunned by how much it's changed since my last visit. Aside from the gambling, there are a few interesting sights; many are related to the region's former life as a Portuguese territory. 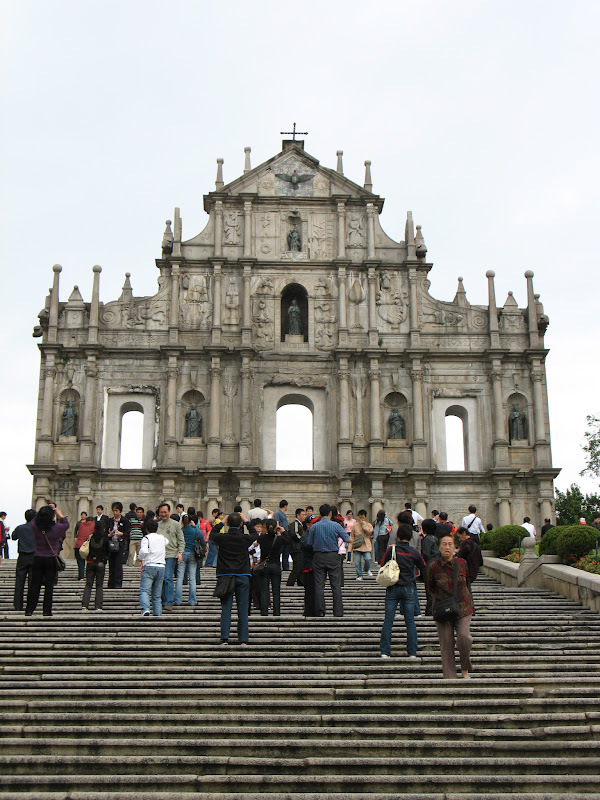 One of the most famous landmarks are the ruins of St. Paul's church. All that's left is a facade. As you can see, the ruins are blanketed with tourists. But really, we were there to gamble. Poor Andy and Dave...they lost a good bit of cash. But go me! I walked away $850 (hong kong dollars) up on the three days we were there. That's about US$110, or enough to fund my stay there. The city's skyline continues to change. In the photo below, you can see a number of casinos, both in business and under construction. 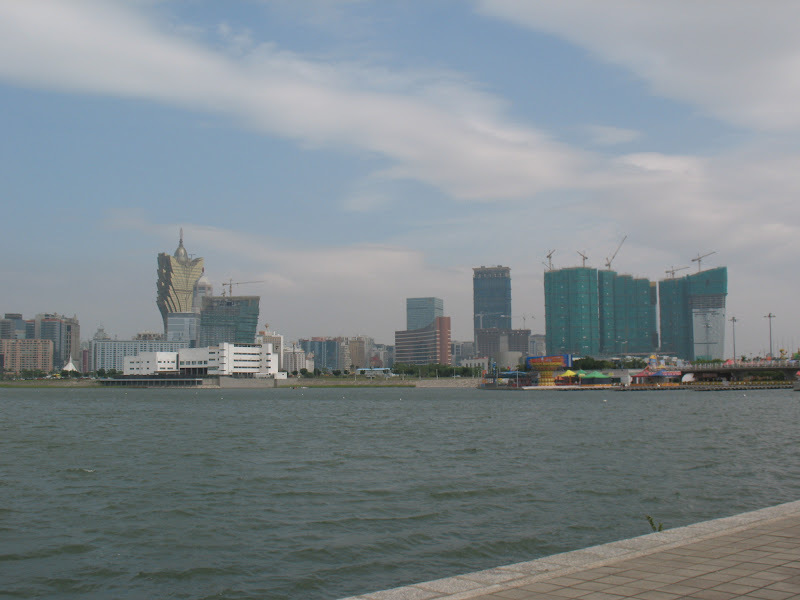 The monstrosity on the left is the Grand Lisboa, the newer counterpart to the Casino Lisboa, perhaps the most renowned and oldest casino in town. The construction to its immediate right is almost assuredly a new casino/hotel. The swooping brown building in the center is the Wynn and the building sticking out behind it is the Star World hotel and casino. To the right of that is the towering L'Arc casino under contsruction; in front of that is another Wynn--the Encore. And between the buildings of the ridiculously huge complex on the right you can catch the slightest glimpse of the MGM Grand. And that's only one part of town. On a new strip of reclaimed land, the Venetian Macau opened last year. It's the biggest casino in the world. Absolutely ridiculous. And across the street from that is a huge new shopping complex. A number of deluxe hotels are in the works as well. It's all part of the new "Cotai Strip," allusion to Vegas intended. 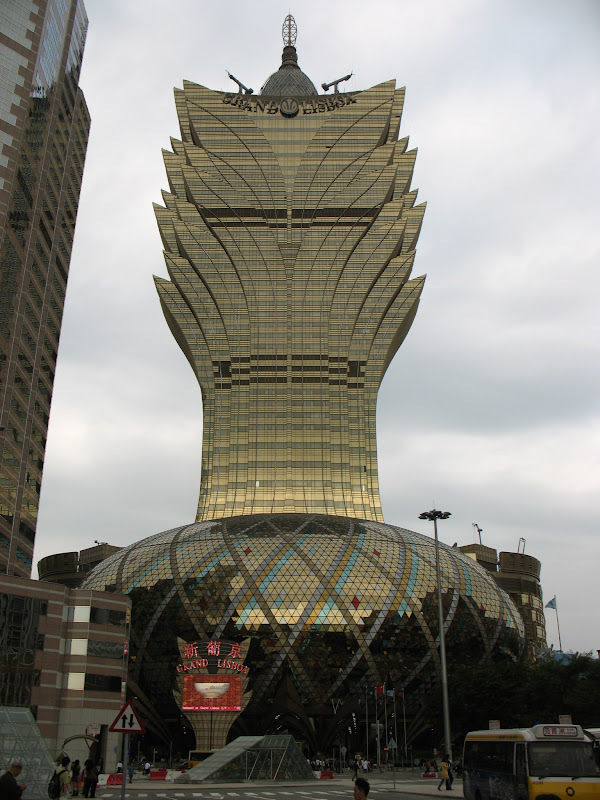 Our favorite casino was the Grand Lisboa. It was huge and over the top on the outside. But the casino was quite pleasant, with high ceilings and a clean, uncluttered layout. There was no sense of the stereotypical "they never want you to leave" setup. And to top it all off, the city was getting ready to host its annual Grand Prix, with streets getting barricaded and grandstands erected. Cha-ching. After Macau, I spent last night in Hong Kong. I'm now back in mainland China--Guangzhou. This is another ridiculously big city. It's a business hub, and where lots of exports out of the country are arranged from. I'll give a full report later and will touch more on Hong Kong next week. And now, how 'bout another tidbit about my mystery destination? In this country, they don't eat with chopsticks. And come to think of it, if anyone can guess my mystery location--via e-mail only--I'll buy you a beer when I get back. It's all about how to choose a correct partner who uses your funds in a right way - that is incorporate it in real deals, parts and divides the income with me.